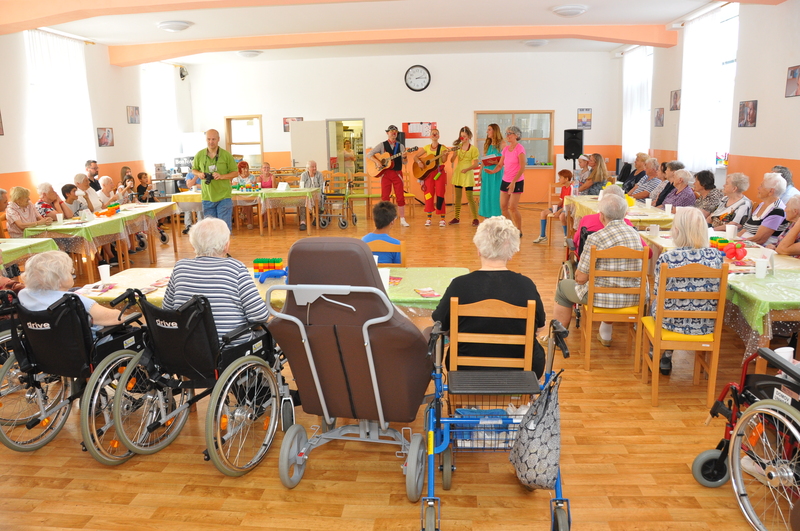 Watch seniors in Unhost sing, laugh and play when kids from the local children’s home drop by for a friendly visit. “It’s the stuff for goose-bumps – really”, smiles Manfred Franke, C4C’s founder who doubled as the photographer for the occasion. “Those seniors were literally becoming young again! Amazing!”, he continued. Organized by C4C’s Petra Erguvanli, Marketa Szabova and J. Rafal Wojas, the multigenerational networking event exceeded all expectations, as young and old really hit it off together! 30 seniors and 12 juniors from the orphanage next door were in attendance at the Unhost Assisted Living Facility for Seniors. There was an amazing transformation, as, just a few minutes into the fun, the initially rather subdued and reserved seniors suddenly warmed upand became lively participants. Loads of pastries, beverages, singing, skits and memory gameswere definitely the recipe for success for the afternoon. Rafal and his Dr. Clown team amazed everyone with his clownish theatrics, skits and games, while Marketa and partner in crime, Martina, provided the musical accompaniment and had everyone clapping along. The children excelled in their task of being help – and respectful to the old folks, as many of them attended the occasion in a wheelchair. They happily served drinks and pastries and helped the elders solve LEGO Six Bricks chellanges, presented by the Dr. Clown team. It all goes to show that a little bit of love goes a long way – oftentimes is just the impetus that’s missing to get amazing results. The synergies between the parties, seniors and orphans, are obvious: both are living in an assisted living facility, separated from their loved ones and often lonely and lacking a caring family environment. They both have much to give – and to receive. It’s truly a win-win situation!